Dance News of the Pacific: "A Little Bit Country....."
Again it was a Showcase to enjoy put on by Kesler & Co. at the Pacific Beach Hotel on Friday November 6th. Doug’s Showcases are always great fun and attract an appreciative audience. Many attendees dressed for the theme of the evening, which added to the easygoing informality of the evening. The buffet food was the usual fare – good but not great. The MC had been brought in at the last minute, which possibly explained the strange pronouncing of names, and the long pauses during his introductions. As usual door prizes are given away during the exhibitions to give the performers a break to change. The ballroom was, as always, decorated beautifully in the theme of the event with wonderful centerpieces on each of the tables. There was lots of general dancing with great music provided by Star Pointe Mobile Disco. Doug was the consummate host welcoming everyone and thanking everyone for their support. So, onto the evening exhibitions of which there were a total of sixteen danced in three parts. Opening the evening was Connie Carroll dancing a Hoe Down with Mr. Kesler – what a great opening number for the evening – filled with fun and energy. Next Mike Agor and Marcia Sorbo dancing a Rumba. Very nice matching costumes, danced a really good routine with good timing. Marcia must watch those heel leads! Jane Roland then dance a Swing with Mr. Kesler that was well put together but needed a little more care. Jane is tall and elegant and has the potential but she needs to relax and enjoy and smile. Dave and Connie Carroll danced a Waltz to “Carolina Moon”. This was Dave’s very first showcase. It started off so good and then…thank goodness to Connie. Beginner’s nerves? However Dave kept smiling all the way through. Good show Dave, look forward to seeing you again next time. Lyla Berg and Mr. Kesler danced a Cha Cha and a Viennese Waltz. Lyla is an experienced performer and it shows. 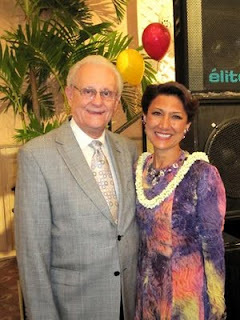 Her presence and showmanship on the floor is great (she did so well at the Hawai‘i Star Ball this year). Her Cha Cha showed good use of feet and legs but I would have liked to see more hip action. Her Viennese Waltz was musical and had feeling but footwork could have been better – heel leads on “1” please. Renna and Sergio Villanueva presented a new formation routine – “Pink Panther Theme” with some very interesting choreography that kept audience attention. Great costume changes. This will be another “winner” along with their “Lion King” routine. Mark and Patty Dela Cruz danced a Foxtrot routine that was cute and had personality plus. It was well danced but at times the timing was a little suspect. Kent Shinomae and Sierra McDermott danced a Cha Cha. Here we have a young couple with so much potential. I hope they keep up the good work. Kent has good body rhythm and leg and foot action that needs a little more discipline. Sierra is an excellent partner for Kent but needs to give more foot pressure and be a little more positive and assertive. Next, Ivan John and Nancy Luckie. Well now, what can I say? This has to have been the top exhibition of the evening. Ivan was a Wolf and dressed for the part, Nancy was Little Red Riding Hood and also dressed for the part. What entertainment! For me the highlight of the evening. What about the dancing? Well I was being entertained by their routine I really didn’t look too closely – but did I see a heel when it should have been a toe? Who cares – a really good showpiece choreographed by Doug. April Patricio danced a Tango with Mr. Kesler. 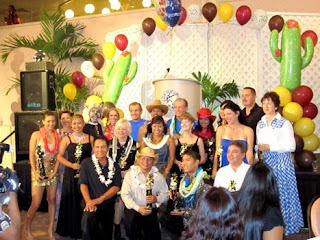 April danced as a junior competitor many years ago at the Hawai‘i Star Ball when it was held at the Hawaiian Regent Hotel. It was great to see her so grown up and dancing in a very elegant black gown. She has great coordination and control. Her high kicks were great. The choreography was beautifully phrased to “Santa Maria” Even though she made a little mistake it was an excellent performance. Stacy Naipo and Winston Myers performed a Waltz that had excellent content. This couple has not had a great deal of experience in performing at showcases and I must say that I was impressed with their performance this evening. Stacy looked so elegant in her black gown. Winston is a perfect partner for Stacy they are so well matched. Stacy needs to work a little more on her footwork and so does Winston who also needs to relax his shoulders and stand up a little more. 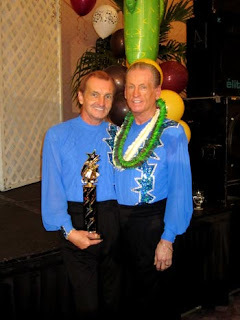 Debbie Nobler danced two numbers with Mr. Kesler – First a Swing which was so well rehearsed with excellent timing and second a Foxtrot with some great lines and excellent footwork that created good movement. I was a little concerned about Debbie’s Foxtrot costume. 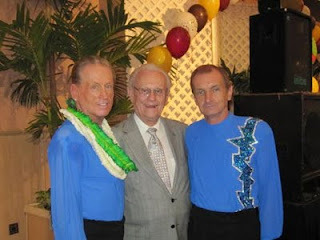 I have left till last the two exhibitions danced by Doug Kesler and his lifetime partner of 21 years, Robert Timosko. They danced together a Swing number to “Boot Scootin’ Boogie” and I must say that Doug did an excellent job as follower but remember that Robert was leading! They both closed the Showcase dancing a Bolero to “Islands in the Stream” and again this was an excellent presentation by both of them. Congratulations to Doug and his students for a wonderful evening of camaraderie, good music, and entertainment. We all look forward to your next showcase March 2010.